Trying to meet all your nutritional needs with food alone can be quite difficult, especially for busy people. It should come as no surprise, then, that many adults turn to the use of nutritional supplements, including multivitamins. Vitalert is one particular brand of multivitamins that may provide the nutritional support you need. VitalertHealth.com describes its Vitalert Energy Multivitamin as a multivitamin, multimineral, and herbal supplement that provides 40 essential vitamins, minerals, electrolytes, and antioxidants designed to improve memory, energy, and health. Vitalert energy multivitamins are available in 100-tablet bottles for $14.99 through the online retailer MedicalProvisions.com. In addition to its multivitamins, Vitalert also produces an energy drink - however, the Vitalert website currently does not provide nutritional facts for this product. 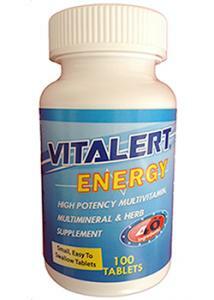 Individuals who are interested in taking Vitalert energy multivitamins are encouraged to take four tablets a day. These tablets can be taken all at one time in the morning with breakfast, or can be taken in two doses - two in the morning with breakfast, and two in the afternoon with lunch. For optimal results, be sure to take Vitalert energy multivitamins on a daily basis. As with other multivitamins, individuals are encouraged to talk with their healthcare provider before adding Vitalert energy multivitamins to their daily routine. Since Vitalert energy vitamins contain soy and bee pollen, they may trigger an allergic reaction in those who are sensitive to these products. Reviewers on Amazon.com rate Vitalert energy multivitamins 4.7 out of 5 stars. Reviewers touted the extra boost of energy that they achieved after taking Vitalert multivitamins, and were especially pleased with the relatively low price, as compared to similar multivitamins. Though whole foods are often touted as a must when it comes to meeting the nutritional demands of the body, this is not always a feasible option for all individuals. Those who are looking for a multivitamin to "fill in the gaps" when it comes to vitamin and mineral requirements may fare well with the use of Vitalert energy multivitamins. To ensure the product is right for you, be sure to talk with your healthcare provider before adding it to your diet.